Help canines find a permanent home. Have a positive impact on the next generation of canine caregivers. Providing training and education to enhance the canine's adoption potential. Providing socialization opportunities through training and daycare. Providing professional coaching in the sensitive task of canine introduction to family canines. Providing "how to" DVDs/Workshops on the most critical aspects of foster/rescue care and training. 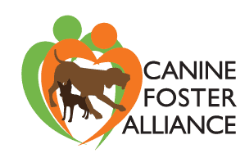 Supporting foster families in the management of multiple canine households. Providing the opportunity for pre-screened rescue and foster canines to work with with a human companion in our Kids and Dogs Camps. This not only greatly increases the potential of adoption, but also provide a child, who does not have their own canine an opportunity to work with and train a canine. CFA also provides scholarships for low income families to enable their children to participate in our Kids and Dogs Camps. To see the impact these camps have had, watch this short video.